International criminal law is at a crucial point in its history and development, and the time is right for practitioners, academics and students to take stock of the lessons learnt from the past fifteen years, as the international community moves towards an increasingly uni-polar international criminal legal order, with the International Criminal Court (ICC) at the helm. This unique Research Companion takes a critical approach to a wide variety of theoretical, practical, legal and policy issues surrounding and underpinning the operation of international criminal law as applied by international criminal tribunals. The book is divided into four main parts. The first part analyses international crimes and modes of liability, with a view to identifying areas which have been inconsistently or misguidedly interpreted, overlooked to date or are likely to be increasingly significant in future. 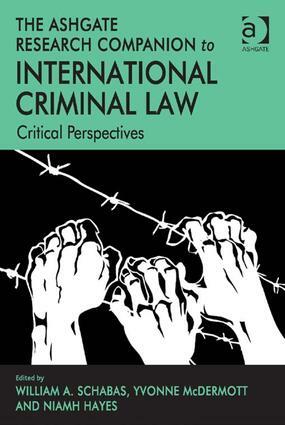 The second part examines international criminal processes and procedures, and here the authors discuss issues such as victim participation and the rights of the accused. The third part is a discussion of complementarity and sentencing, while the final part of the book looks at international criminal justice in context. The authors raise issues which are likely to provide the most significant challenges and most promising opportunities for the continuing development of this body of law. As international criminal law becomes more established as a distinct discipline, it becomes imperative for international criminal scholarship to provide a degree of critical analysis, both of individual legal issues and of the international criminal project as a whole. This book represents an important collective effort to introduce an element of legal realism or critical legal studies into the academic discourse. Contents: Preface; Introduction, Niamh Hayes, Yvonne McDermott and William A. Schabas; Part I International Crimes and Modes of Liability: Sisyphus wept: prosecuting sexual violence at the International Criminal Court, Niamh Hayes; Creating a framework for the prosecution of environmental crimes in international criminal law, Tara Smith; Alleged aggression in Utopia: a international criminal law examination question for 2020, Roger S. Clark; The Special Tribunal for Lebanon and terrorism as an international crime: reflections on the judicial function, Ben Saul; Damned if you don’t: liability for omissions in international criminal law, Christopher Gosnell; Joint criminal enterprise liability: result orientated justice, Wayne Jordash. Part II The International Criminal Process: Rights in reverse: a critical analysis of fair trial rights under international criminal law, Yvonne McDermott; Victims’ participation at the International Criminal Court: benefit or burden?, Lorraine Smith-van Lin; A shifting scale of power: who is in charge of the charges at the International Criminal Court?, Dov Jacobs; Distinguishing creativity from activism: international criminal law and the ’legitimacy’ of judicial development of the law, Joseph Powderly; Equality of arms in international criminal law: continuing challenges, Charles Chernor Jalloh and Amy DiBella; Protecting the rights of the accused in international criminal proceedings: lip service or affirmative action?, Colleen Rohan; Reconciliation and sentencing in the practice of the ad hoc tribunals, Silvia D’Ascoli. Part III Complementarity and Sentencing: a Discussion: A sentence-based theory of complementarity, Kevin Jon Heller; ’Sentencing horror’ or ’sentencing heuristic’? A reply to Hellers’s ’sentence-based' theory of complementarity, Carsten Stahn; Three theories of complementarity: charge, sentence or process? A comment on Kevin Heller’s sentence-based theory of complementarity, Darryl Robinson. William Schabas is Professor of International Law at Middlesex University, UK, Yvonne McDermott is Lecturer in Law at Bangor University, UK and Niamh Hayes is Head of Office at the Institute for International Criminal Investigations, The Hague, the Netherlands.